Quite large miniature sheet, 22 x 17 cm and each stamp has a face value €1. The whole stamp was printed in intaglio process (raised-ink), giving a 3D looking and for my personal view: IT IS REALLY BEAUTIFUL. A total of 13 Spanish cities are part of the list of Joint Urban Heritage and recognized by UNESCO for the interest of their historical and artistic helmets. Toledo, heritage city and motive of this issue, has this designation since 1986. Old imperial city and cultural center in the Middle Ages and the Renaissance, Toledo stands on a hill bathed by the Tagus River. Its urban layout has remained almost unchanged throughout the centuries, where its narrow, winding streets, flanked by Gothic, Moorish and Renaissance buildings, prove their historical past. City museum and monuments, preserves the mixture of three cultures that populated the streets, Christian, Jewish and Muslim. It has a walled enclosure and different access points, such as the Alcantara bridge, the Gothic Bridge of San Martín, the Puerta del Sol, the door hinge, door and door Cambrón Valmardón. Among its most prominent buildings fit cite the Cathedral, the Gothic style; the Monastery of San Juan de los Reyes; the Church of Santo Tomé, in whose interior is the work of El Greco The Burial of the Count of Orgaz; the Mezquita del Cristo de la Luz, of Caliphate; the synagogues of Santa María la Blanca, and Traffic and monumental Alcázar. 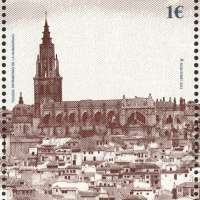 Toledo, Alcalá de Henares, Ávila, Cáceres, Córdoba, Cuenca, Ibiza / Eivissa, Merida, Salamanca, San Cristobal de la Laguna, Santiago de Compostela, Segovia and Tarragona, ie the 13 urban complexes heritage, founded in 1993 the Group of World Heritage Cities of Spain. This association, nonprofit, aims to act jointly in the defense and promotion of historical and cultural heritage of the cities that compose and defend common interests, explore solutions to similar problems and promote cultural tourism quality. 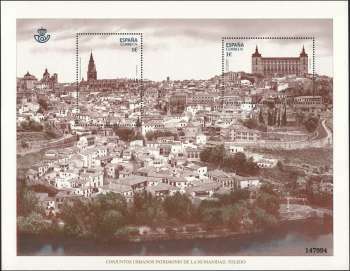 The souvenir sheet, printed in intaglio, reproduces a view of Toledo taken from the other bank of the Tagus. 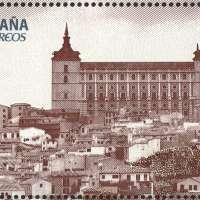 The stamps are spotting The Primate Cathedral of Saint Mary of Toledo and Alcázar.